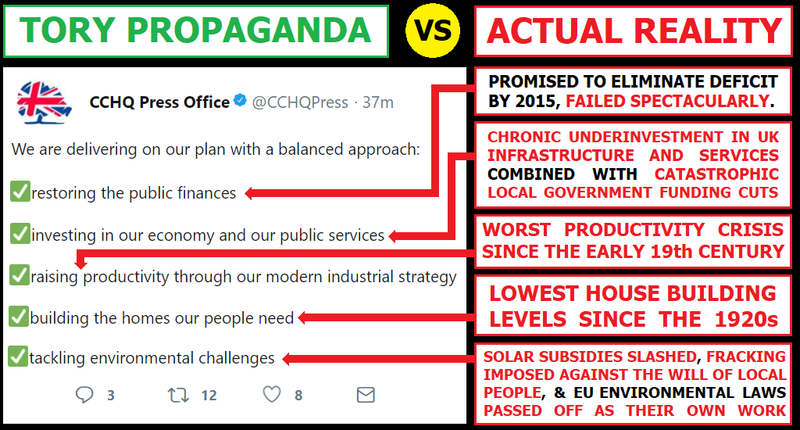 The Tory party are absolute masters of creating Orwellian reality-reversing propaganda in order to dress up their biggest failings as wonderful successes that we should be thanking them for! Take this extraordinary Tweet from the CCHQ Press Office Twitter account. Every single one of the five areas they've listed as successes is actually a massive government failure, but they're so arrogant that they imagine the general public to be so gullible that they'll just look at the five green ticks and conclude that the Tories have been doing a great job, without bothering to conduct even the most rudimentary analysis of the actual claims. This article exists just to provide verification of the information in the red boxes in the critique above. When the Tories sneaked back into power in 2010 they immediately imposed hard-right austerity dogma, with the promise that their agenda of massive cuts to infrastructure investment, welfare spending, workers' wages. and public services would have eliminated the deficit by 2015. It's now 2018 and there is still a huge deficit, which the Tories are now admitting won't be cleared until 2031. That's 21 years to achieve what they bragged they would do in less than 5! Anyone would have thought that the Tories would be so ashamed of this that they'd keep as quiet as possible about their economic track record, but they've simply reversed reality in order to blow their trumpets about what a wonderful job they've been doing! Tory austerity dogma has resulted in the UK getting left behind on the world stage. We've got one of the lowest levels of investment in infrastructure spending in the developed world, and our public services have been cut back to the bone. Then there's the fact that government funding for local government services (care for the elderly, highways maintenance, public libraries and leisure centres, bin collections, children's services, planning applications ...) has been slashed by an astounding 67% since 2010. The Tory fixation with hard-right austerity dogma is a cancer eating away at public infrastructure and services, yet they're actually patting themselves on the back and pretending that they've been investing in this stuff rather than slashing it all to pieces. You'd have to have been living in a lead-lined box for the last few years to have not noticed the fact that the UK is suffering a massive productivity crisis. Not only has the productivity of UK workers been flat-lining for the best part of a decade (the worst period since the 1820s), all the other major economies in the G20 except South Africa have experienced better productivity growth, meaning we're being badly left behind on the world stage. The reason for this collapse in UK workers' productivity are obvious. The Tories imposed the longest sustained collapse in workers' wages since records began, and they've also overseen an absolute boom in unstable low-pay jobs like Zero Hours Contracts and fake self-employment in the gig economy. The Tory drive to turn the UK into a low-wage low-skill economy has come at the expense of trashing workers' productivity, yet once again they're slapping themselves on the back over this catastrophe! Yet once again they're seeking to take credit where they should actually be begging the public for forgiveness! In 2015 the Tories announced a massive cut to solar subsidies which predictably resulted in a collapse in solar power installations. Meanwhile the Tories handed a vast tax break to fracking companies, and even granted licences to frackers despite overwhelming opposition from local people and environmental groups alike. More recently the Tories have been trying harder to pretend that they care about the environment, but their efforts have been limited to dressing up new EU laws on plastic pollution as their own work, despite the fact that Tory MEPs voted against these new rules as they made their way through the European Parliament. Once again, the Tories are passing off their failures as successes in the belief that the general public are a hopelessly gullible bunch of halfwits who mindlessly believe what they're told, even though it's entirely at odds with observable reality.